Post videos to Youtube, or Vimeo or Viddler or all of them. -Write a Blog Post elaborating on the questions and embed your video. 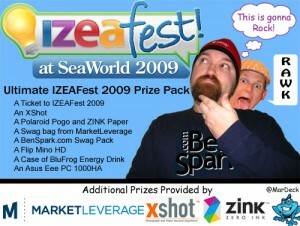 Take a look at my 10 Great Reasons to Go to IZEAFest 2009! & 10 Items to Bring With You to IZEAFest 2009 posts. Read them and add an 11th reason for both in your post. -Posts should be tagged with izeafest, benspark.com and marketleverage. -Your post should link back to the contest post and encourage others to enter. It’d also be nice also to link to the contest sponsors for their great contributions. -Leave comments with links to your video(s) (if posted on multiple sites) and your blog post. *Videos and blog posts will be judged by a Panel of Bloggers : Murray Newlands (And more to be announced at a later date) and the winning blogger will be selected on Tuesday August 11th and announced the following Monday August 17th on MarketLeverage TV. The winner’s video will air on the show as well! I’m very happy to have you as part of the panel of judges. Thanks so much for helping me out on this. I am really honored to be asked to be judge. I am only disappointed that this means that now I can not be the winner.